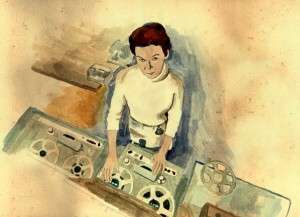 The original Doctor Who theme composer and electronic music pioneer Delia Derbyshire is to be celebrated at an event conceived by local electronic musicians. Band On The Wall will host the event which looks at the life and work of the revered sonic explorer, who was employed at the BBC Radiophonic Workshop from 1960 to 1973. During this time she composed music based on a score by Ron Grainer, which was famously used as the theme music to Doctor Who for 18 years before being progressively tweaked for more recent series. With much to consider, the day will be broken into sessions. The afternoon session introduces some experts on Derbyshire’s life, her musical field and electronic music’s origins generally, who will take part in panels to impart their knowledge, discuss and answer questions around preset topics. One of the panellists, Kara Blake, directed the award-winning documentary The Delian Mode which will also be screened during the day. Following this, three local musicians who have been permitted access to the Delia Derbyshire music archives stored at the University of Manchester will present the results of their research, before combining under the moniker Delia Darlings to perform together for the evening concert. The trio – Caro C, Naomi Kashiwagi and Ailís Ní Ríain – have pursued electronic music in different, often abstract ways, but all have been inspired by Derbyshire. Naomi Kashiwagi has developed sounds by manipulating an old gramophone, Caro C has used gadgets from samplers to sequencers, and Ailís Ní Ríain has arrived at a similar place via a contemporary classical route. In the week following the Manchester show the premise will be touring the North and visiting Liverpool, Sheffield and Newcastle, featuring a similar programme of events. Delia Derbyshire Day 2013 takes place at Band On The Wall on Saturday 12 January from 3pm. For more information and tickets, visit the website.